Nicolas Kyvernitis Electronics Enterprises (NMK) has completed its current series of educational seminars with a successful event in Salmiya, Kuwait. The distributor reports that it was ‘pleasantly surprised’ with the turnout for the event, which attracted A/V professionals from broadcast, rental and installation companies. Having first taken to the road in November last year, NMK Roadshow has hosted sessions in Doha, Muscat and Manama before arriving in Salmiya. Attendees were introduced to a selection of products from the distributor’s brands, with the Shure Axient Wireless System, Neutrik Xirium wireless audio system, and Clear-Com, Roland AV and HK Audio products forming the most discussed topics. 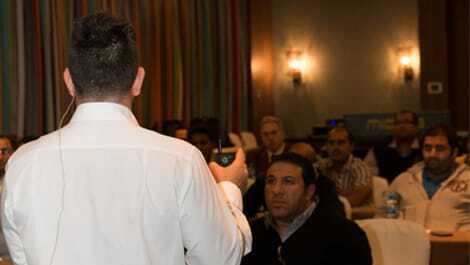 According to the distributor, attendees were ‘interactive and eager to learn’. "NMK Roadshow was not only a great experience for our attendees, but also an unforgettable moment for the whole NMK team that took part in organising such a flourishing event. Interactive and knowledgeable attendees together with our passionate and experienced product specialists certainly made the Roadshow a successful event," commented Jana Urbanovska, Marketing Executive at NMK. "There is no doubt we will continue in bringing similar experience to A/V professionals starting with the upcoming NMK Academy 4.0 held in Dubai during May and June this year."